Continuing the ongoing series of interviews with creative artists working on various aspects of movie and TV productions, it is an honor to welcome Patrice Vermette. His portfolio spans hundreds of TV commercials, dozens of music videos and such recent notable films as “Young Victoria”, “Enemy”, “Prisoners” and his latest “Sicario”. In this interview Patrice talks about getting into the field in the early ’90s, building the trust with his main collaborators and working with the same director on multiple productions, the impact of high-definition shooting and viewing equipment on his craft, the evolution of digital tools for set extensions, what happens to the sets when a production is done and what makes him stay in the industry even after all these long years. The second half of the interview is about his work on “Sicario”, from the opening compound sequence, to building the sets of the Homeland Security office, the gigantic expanse of the border shootout, and the intricate setups of the underground tunnels. Patrice: My name is Patrice Vermette and I’m a production designer. I got into the industry around early 1991. When I was a kid in 1977, my dad took me to see a movie called Star Wars and it blew me away, and I started recreating those worlds in my parent’s basement. I didn’t know it back then, but it was the seed that was growing inside me – to want to have that in my life. I grew up in Montreal, Quebec, and it wasn’t necessarily a reality for us. It wasn’t US or France or Germany or England. The local movie industry was looking much more towards documentaries or political comments. In 1990 I graduated from the communications program at Concordia University in Montreal. My dream was to make soundtracks and produce albums. In late 1990 / early 1991 I was doing PA work on commercials, and in March 1991 I was invited to work on a video on which the art director showed up totally stoned [laughs]. I had a friend who would come to see my band live, and for those performances I used to make a new decor for each show. That friend was working as a grip on that video, and he introduced me to the director, telling him that maybe I could help out, as the next day the shooting was starting, and nothing was being done. That director offered me the job, as he pretty much had no choice [laughs]. I said that it wasn’t really what I did for a living, or wanted to do, but I promised to give it my best shot. The next day we had a set standing up with some help from my good friends that had never done that in their life either. And from that day on that director offered me all his jobs as a production designer. Princess Victoria and Duchess of Kent’s Kensinton Palace Bedroom on “Young Victoria” at Shepperton Studios 2007. Courtesy of Patrice Vermette. That movie had huge success in Canada and a lot of people saw it at festivals throughout the world, and it gave wings to both of us. Those were my early years. Kirill: How was it seeing the scope of a feature film for the first time? Patrice: I used to do pretty big commercials, so it wasn’t a very big transition. I saw that I would work for a longer period of time, and work with characters. I think of production design as the back beat, the baseline, the drums that create the visual rhythms for a story, and that’s always been my approach. If it’s a good story, and I always try to choose my movies based on that, it’s always challenging and exciting. You might have a small budget or a big budget, but it’s always about the story and the script for me. It’s always quite exciting to support the story and to be invisible. That’s always one of my goals – not to show off, just to be invisible and help tell the story. 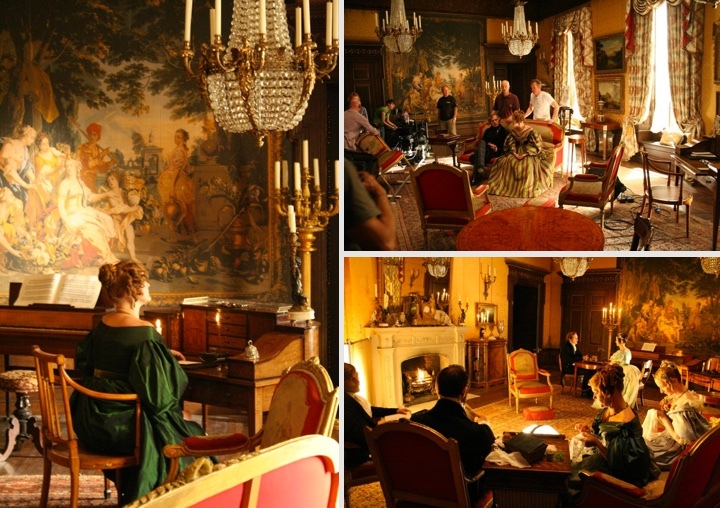 Duchess of Kent Drawing Room on “Young Victoria” at Shepperton Studios 2007. Courtesy of Patrice Vermette. Kirill: You’ve started working 25 years ago. Have things changed much for you? We’ve seen the high-def projection equipment and home TV sets taking over, and almost everything is done digitally. Does that require you to be more detailed and precise with your sets? Patrice: Of course. You have to be so detailed. When I started doing music videos, that was on 16mm. Then we moved up to commercials and 35mm. Now we’re working with 4K cameras. Everything needs to be so precise, and I feel that it’s super-exciting, because no producer will now tell you that nobody would see something. People will see that, and it’s important to be very thorough on the finishes and details. The camera sees everything now. There is nowhere to hide. It’s also changed a lot for make-up, hair and scenic painters. Everybody needs to be at the top of their game, because a lot of the things that used to work in front of the camera now do not. The technology has put an extra pressure on us to be very detailed in our work. Kirill: Does it help to have digital monitors on the set so that you can immediately see what the camera sees? Now that we’re living in the digital age, the monitors are great. 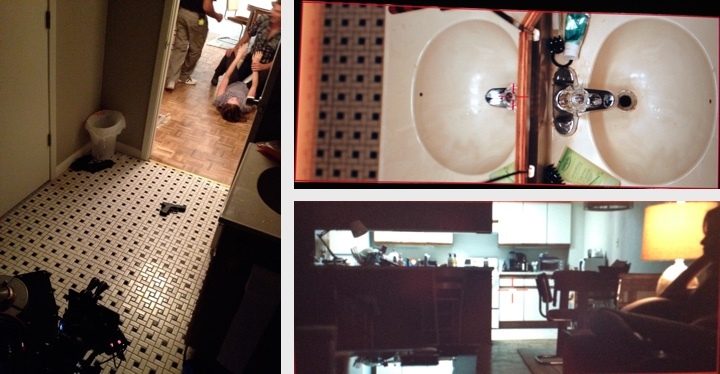 I think that it took away a lot of “secret” powers from the DP [director of photography]. What you see is what you get, and the DP is no longer seen as the magician. It gives the rest of the crew an opportunity to see how it looks. It really helps everybody, and we’re all less annoying to the DP. We used to ask to look at the set through the camera’s view finder. It’s a great tool now. A quiet and peaceful maze like neighbourhood on “Prisoners”. Courtesy of Patrice Vermette. Kirill: What is your experience with digital set extensions and how those capabilities have evolved recently? Patrice: I think that’s also a great tool. There are some visual effects [VFX] companies that try to take over and do kind of fireworks effects, try to impress everybody with too much VFX. But you need to think of it as a tool for things that are invisible to the viewer and for things that are there to help the story. It’s not just extensions, but also other elements. When we shot “Prisoners”, all the driving and the rain and the sleet were done in VFX. And there’s not a lot of people who realize that. It was there to help the story. On the sets of “Prisoners”. Courtesy of Patrice Vermette. Kirill: What is the decision process to do that? Is it because of the budget, or the uncooperative weather in this particular case? Patrice: You need to think and analyze. For example, take the border battle on “Sicario”. We read the script, and looked at the storyboarded shots, and started talking about the best way to do what we dreamed of in our minds. Should we do that practically? Sometimes that’s the best. And sometimes you do it on stage, dressing part of the exterior and doing set extensions because it would be insane to build everything. It would have been possible to do the rain on “Prisoners”, but the realism of the sleet that we were looking for would have taken too much time to achieve practically. Also, the car movement wouldn’t be so fluid and free. We did tests and the decision was to do it in VFX. That way everybody had more control – the actors, the director, the DP. And the final result was what we wanted it to be. You look at what you want to achieve and discuss what’s the best way to get there. Sometimes it’s not about the budget. Mostly it is about the best result possible. 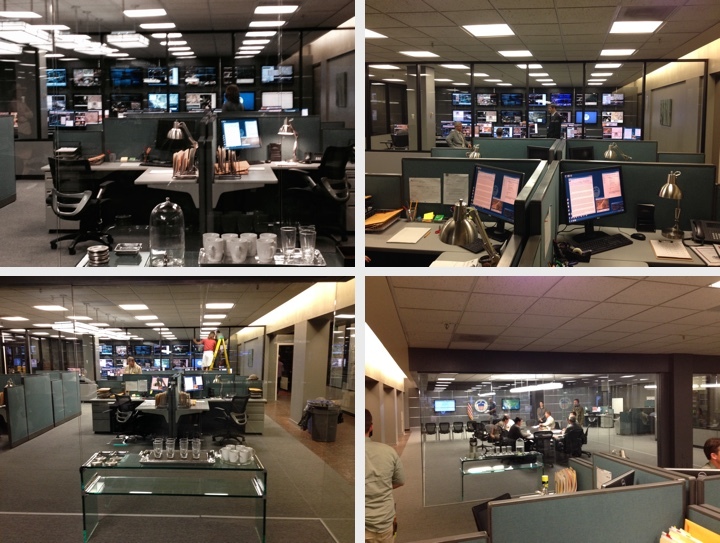 The cell set of “Prisoners”. Courtesy of Patrice Vermette. Kirill: Are you concerned that at some point the capabilities of those digital tools would be so powerful that they would start encroaching too much into the world of physical sets? Patrice: I used to be afraid of that, but I think now there’s a great balance that’s been reached. For budgetary reasons there’s always a push for VFX. But I think that the artistry of the DP and the director and also the actors that want to play in a real environment – that box will still exist. We’ve seen disasters of movies that mostly used green worlds, such as “Star Wars” in the ’90s. I know that the technology has evolved a lot since then, but people on the set still prefer the realism. Last year I worked with the director Denis Villeneuve on “Story of Your Life” which has now been retitled to “Arrival”. We’ve built a pretty big set, and obviously that set could have been done in CG. But the real set has all those reflective surfaces for the DP, and it gives the real space for the actors, and it was a big plus for everybody. I think that it also helps the performance of the actors to be able to play in a real environment. It sets the mood. 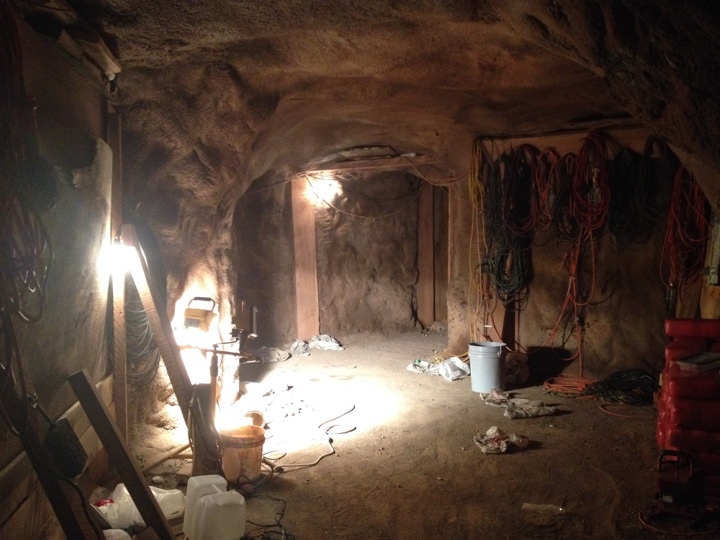 The tunnels sets on “Sicario”. Courtesy of Patrice Vermette. Kirill: Transitioning to talk about “Sicario”, how and when did you join the production? Patrice: Prior to that, I had done two movies with Denis [the director] – “Enemy” and “Prisoners”. He sent me the script and asked me to let him know if I wanted to join him. I have a lot of trust in Denis and I loved the script, and Roger Deakins was going to be the DP. It was just obviously the right combination. Very early on I went with Denis, Roger and the producers John Starke and Edward McDonnell to New Mexico. We looked at the possibilities there and that’s where we ended up shooting. There were a couple of missing links about locations, and the big question was about the border battle. I said that we had to build it. There was no way that we could ever shoot at a real border. And we couldn’t find any large enough highway, or a highway that was under construction that we could close for five days. That was how much time we assumed we needed to do that scene. That was the first set that I drew when I came back to Montreal. I think “Sicario” is a good example of a seamless collaboration between heads of departments. Music, editing, directing, cinematography, VFX – everything was great. Everybody joined together in a very collaborative effort. It was a great example of storytelling. Nobody was trying to show off, and everything was there for a reason. I’m very proud of that movie. The motel sets on “Sicario”. Courtesy of Patrice Vermette. Kirill: Does it get easier after you’ve done a couple of movies together with the same director? Patrice: Of course. You don’t need to talk as much. It shortens the discussion. Everybody knows where their place is, and what is expected of them. But the danger is that you should never take that relationship for granted. As long as you don’t do that, it’s great. Kirill: How much time did you spend on pre-production on “Sicario”? Patrice: It was about 14 weeks. We were based in Albuquerque at ABQ Studios. It’s an amazing facility. We also had a missing link about all the driving in Juarez. 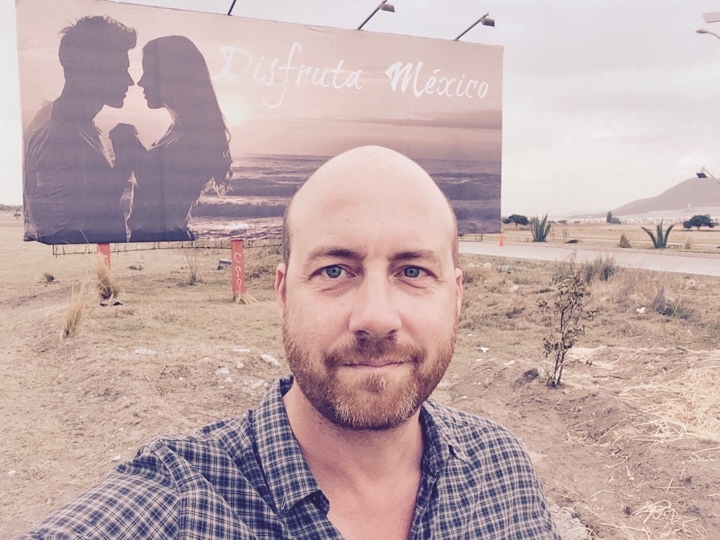 When we were in the middle of shooting, the producers sent me to Mexico City. I already did some work on commercials there, and I was pushing for it. I was there for four days, and I had to come back with a plan. I spotted some areas that I thought were a good match for Juarez, and that’s where we ended up shooting. If you’re talking about collaboration, things worked out well with the producers, as I’ve already worked together with some of them on “Prisoners”. I went there alone and they trusted my judgement. Having trust in your collaborators makes the team stronger. It also goes for my own department, I always try to keep my key people. 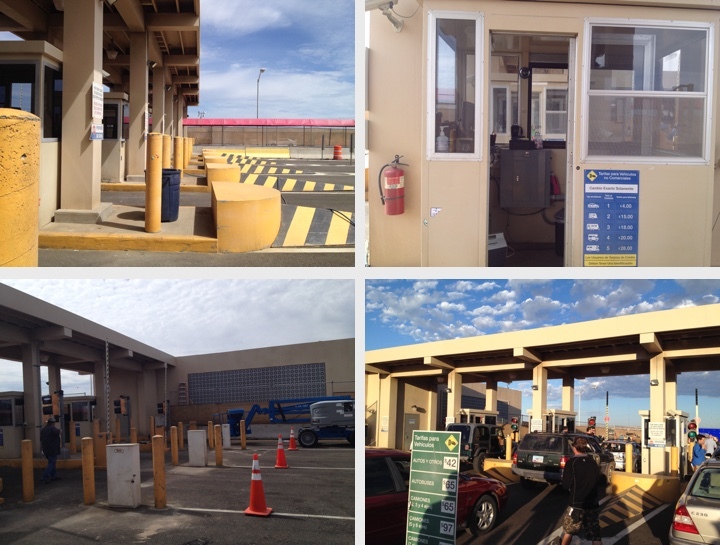 The border crossing set on “Sicario”. Courtesy of Patrice Vermette. Kirill: And you start hiring those people in your department during the pre-production. Patrice: Yes. I had my dear friend supervising art director Paul Kelly with whom I just finished “American Express”. He’s my right hand in the department. And I’ve had a chance to discover Jan Pascale who was my set decorator. She’s fabulous, and I hope we’re starting a long-term relationship. Kirill: The film has a very strong visual language. When is that defined? Patrice: We start with the moodboards that I did, and then we share photography. Roger brought a photographer up Alex Webb pictures who shot a lot of images in Mexico. It was a collaborative effort between Denis, Roger and myself very early on during the pre-production. We knew what we were looking for, the look that would work for the story. Then we kept on carrying and pushing it, adding more details. That was very solid from the very start, and it was our goal that we carried on. The Homeland Security set on “Sicario”. Courtesy of Patrice Vermette. Kirill: Was it shot mostly on locations or on sets? Patrice: It was a mix. When we don’t find what we’re looking for, that’s when we build it. If you don’t find a place with the energy that works for everybody, it’s better to build it. But if we do find it, I’m happy to shoot on location. And it’s almost always a mix of locations and sets. You want to create something that matches what you had in your mind. And sometimes you look for a location that you know you’ll never find [laughs]. It makes it clear for everybody that it won’t happen. 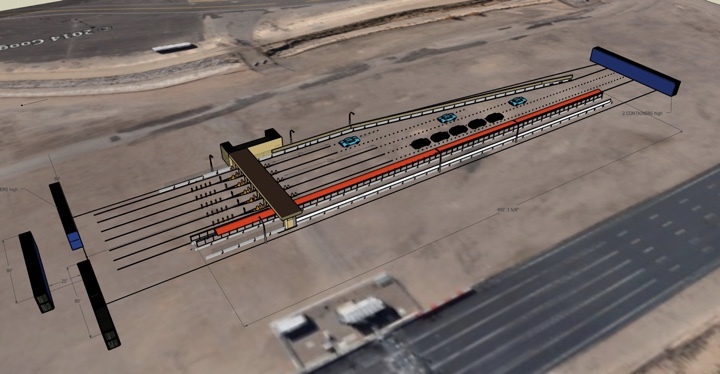 It helps to convince everybody that we need to build it. We have a vision, and everybody carries it on, unless we agree to diverge from it. The Arizona compound set on “Sicario”. Courtesy of Patrice Vermette. 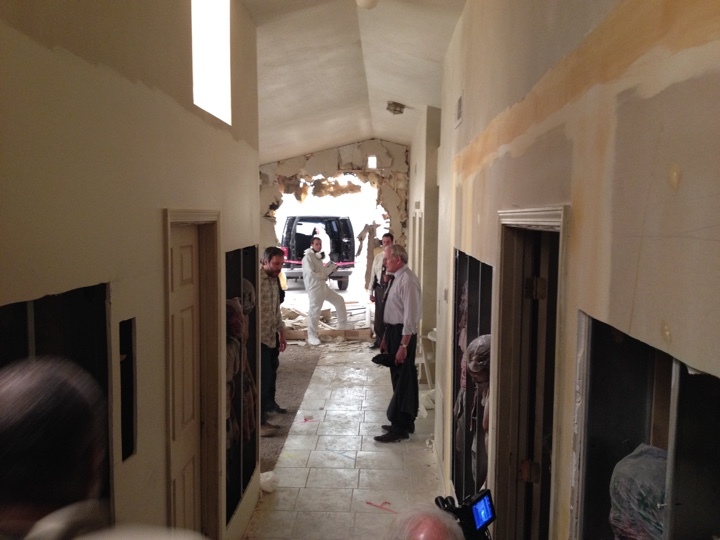 Kirill: If we’re talking about the Arizona compound at the very beginning of the movie, was that a set or a location? 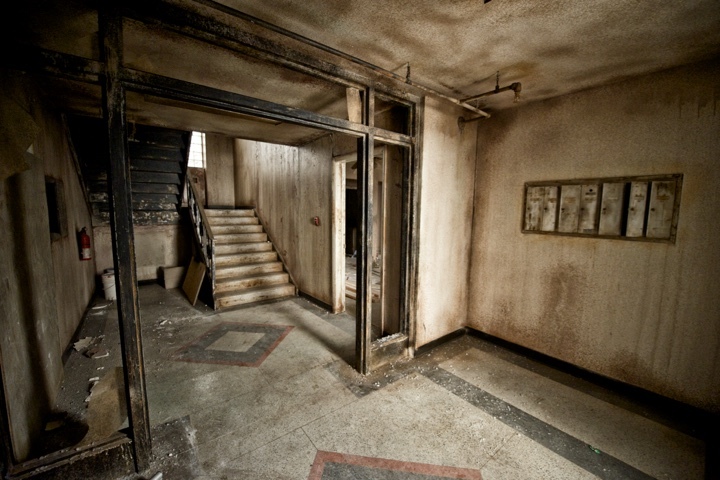 Patrice: That was a set, but it was based on a location that our location manager Todd Christensen found. The location fit the description that we had, but we couldn’t do much inside of it. That’s why we decided to build it because otherwise it would have been impossible to shoot on that location. 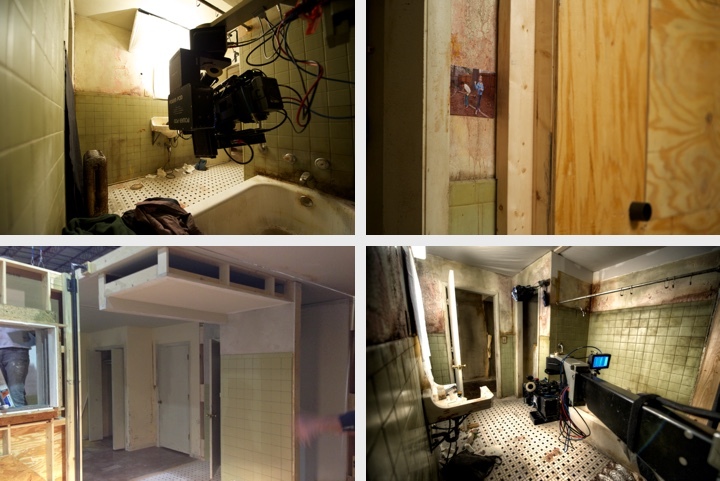 That set pretty much matched the location that we all loved but never shot in it. You have the explosions, and the bodies in the walls – it would have been very painful to do that on a practical location. Everything that is inside the house was built, including the little courtyard that you see from the windows. And the outside is on location, but whenever you’re in the house, it’s staged on set. We also did the same for the apartments and the motel room. 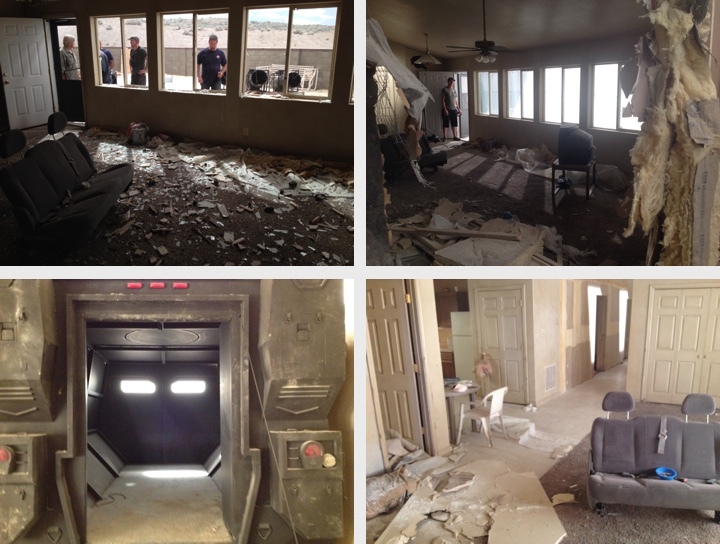 The Arizona compound set and armored vehicle inside (bottom-left) on “Sicario”. Courtesy of Patrice Vermette. 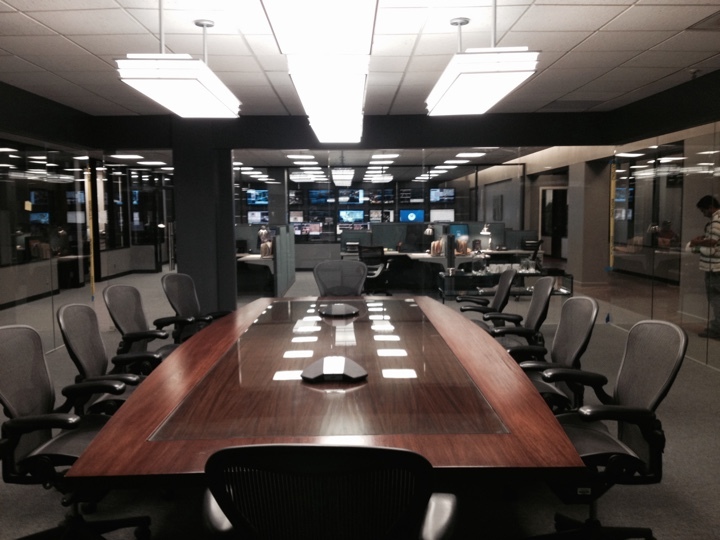 Kirill: What about the big conference room at the Homeland Security? Patrice: That was an empty office building that was once occupied by an Albuquerque newspaper. We built everything inside that room – the glass-wall conference room, the carpets, the paint, another layer of glass in the back with TVs. It was a mix of location as a shell and building everything inside of it. Kirill: How much time does it take to build something like that? Patrice: For the compound, between drawing the plans, building and set dressing, it would be around at most three weeks. Kirill: So more or less, as you look at the scope of the sets, you know roughly how much time it’s all going to take. Patrice: First of all you need to draw it, make the plans, evaluate the budget and make sure that it sits within the envelope. Then you get the approval, buy the materials, build and set-dress. Kirill: What about the tunnels? Patrice: We built all of them on stage. 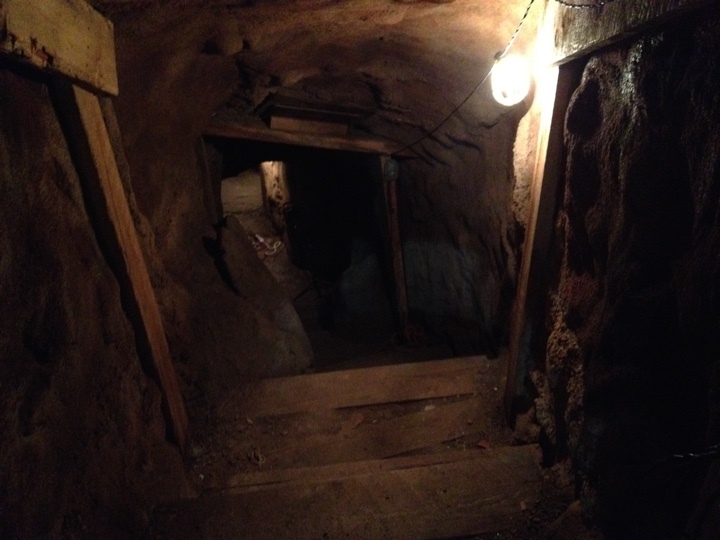 We needed space for the camera to move around, and just to find those tunnels would have been crazy. Very early on we decided to build them, and we employed a few tricks. It would’ve been ridiculous to build them to the size that we needed, but fortunately tunnels look the same everywhere. You can walk in a tunnel in the dark and it kind of looks the same. We had some tricks on Stage 3 at the ABQ Studios. We’ve built the first structure there, and on the other side we had other sets – part of the saloon and Kate’s apartment. 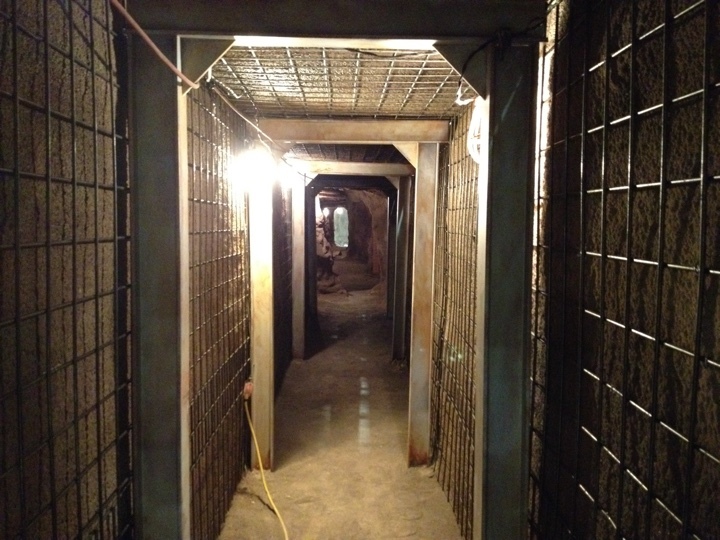 You have a big soundproof door between those two stages, and that’s where we were building the main tunnel structure. And then we’ve built extensions of those tunnels, but with false perspective. We had black fabric drop, and then another 8-foot part with lights and dirt walls, then another 20-foot black section and another 8-foot lit section. And all together they would create the false perspective, creating an impression of a much longer tunnel. 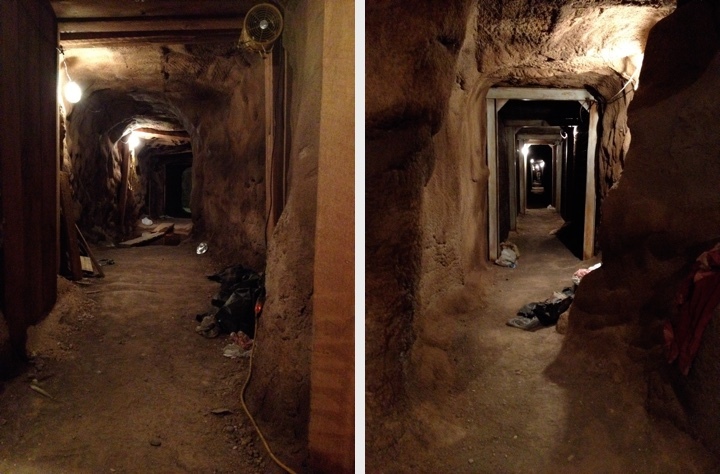 The tunnels set on “Sicario”. Courtesy of Patrice Vermette. Kirill: Was it built to be wider than in reality to accommodate the crew and the equipment? Patrice: It was not that much wider. We had support beams, and we could take some of them out to make space for the camera. It was slightly bigger, but otherwise it wouldn’t have looked real enough. It was just slightly exaggerated. It was five-foot high. Kirill: You talked about building a set for the border shootout. How big was that? Patrice: That set was about 800 feet long, and about 140 feet wide at its widest. We put the tarmac and the asphalt down. 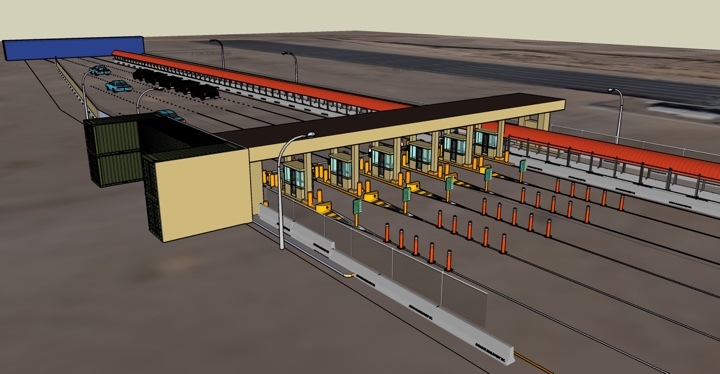 We built the toll structure and the walkways around it, and at both ends we had three-container high stack for set extensions. That whole set was the border pass between El Paso and Juarez. We had “doors” within the k-rails portion of the set to allow us to bring in more cars and more equipment. I think it would’ve been impossible to shoot that scene the way we did anywhere on location. 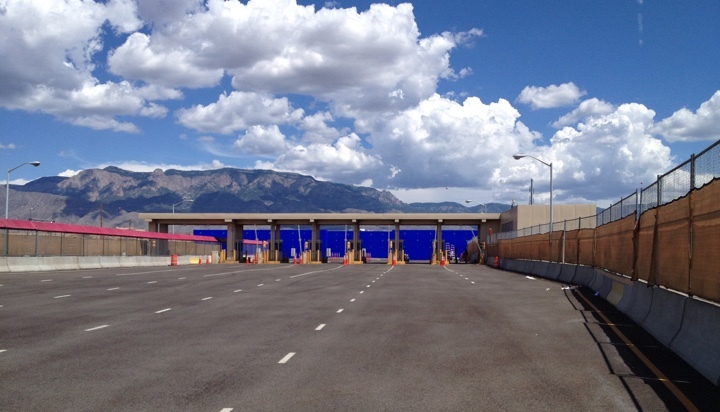 We had blue screens for set extensions on those containers at both ends, and about 250 cars on the set. A schematics drawing of the border crossing set. Courtesy of Patrice Vermette. Kirill: What about the “Wild Pony” bar? Patrice: That was on location, but we had to reshoot the dancing part later and we did that on set. That was on Stage 4 where we were building the tunnels, but the actual bar was a location. When we did additional photography, instead of going back to that location for the additional photography, it was more practical for us in a tight schedule to build the small portion of that bar on stage. That’s where we also had the interior of the armoured vehicle that you see at the very beginning of the movie. It allowed us to be more efficient on our shooting schedule. 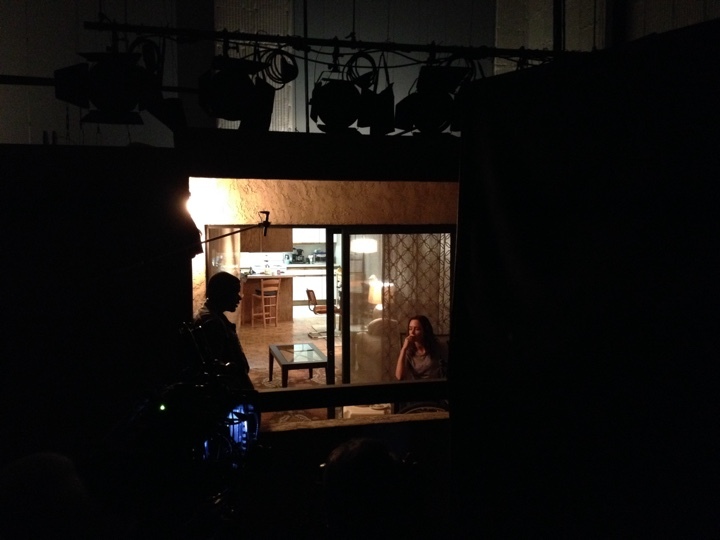 Kate’s apartment set on “Sicario”. Courtesy of Patrice Vermette. Kirill: You build these sets and then you have to tear them down. Has that become part of your job, or are you still sad to see that work essentially gone? Patrice: Actually the sad part of it is not seeing it gone necessarily because the work will exist in the movie… Actually, sometimes it doesn’t because some sets and scenes don’t end up in the final cut. But that’s a different issue. What makes me sad is the environmental aspect of it. Some of the materials can be recycled. They chip the wood and they make new support beams, the metal get also recycled but it’s always sad to see all the material that you are not able to recycle. That’s the sad part for me, and not when sets are being torn apart. Kirill: You work on a movie for a long time, and then you go to the movie theater to watch it. As you know every single set, and the script itself, can you still enjoy the final product? Patrice: First time you see it, it’s like it doesn’t belong to you anymore. It’s the whole process of making a movie, like giving your baby away for adoption. When you build a set, and the director and the DP and the crew come in, you have to let go. I think you have to go see the movie the second time to really appreciate it. First time you’re still thinking about the baby that you gave up, so to speak. You have a certain way of looking at the image that a normal spectator would not. The second time around you can enjoy it more even though you know the story. It’s part of the job. You accept it. Kirill: And there are so many layers that were added on top of what you did, with editing and music and color correction and visual effects. Patrice: Exactly. It’s kind of like seeing that baby graduating. I actually think “Sicario” was the first time where it was exactly the way everybody saw it when we were making it. Most of the movies, at least for me, require second viewing. It’s hard to keep an objective perspective on the work that you’ve seen so many times. As a designer, I don’t really follow the editing process, and usually it’s the second time that I see the final cut that I really appreciate it for what it is. Kirill: You’ve been in the industry for 25 years. What makes you stay? I’d imagine that the hours are long, and you spend months away from your family, and production schedules are not very predictable. Patrice: It’s kind of a drug [laughs]. You are addicted. It’s passion. You want to tell stories the best way you can, and to see the audiences react to them in a hopefully good way. It’s a big pleasure to see that. We try to do our best, and as long as there are good stories that we can tell, I don’t think this passion will diminish. You don’t want to be away from your family for seven months, but sometimes you read a script, and you feel that it’s a story worth telling, and you think it will make everybody happy in your household. But you’re right, it’s a lot of sacrifice. 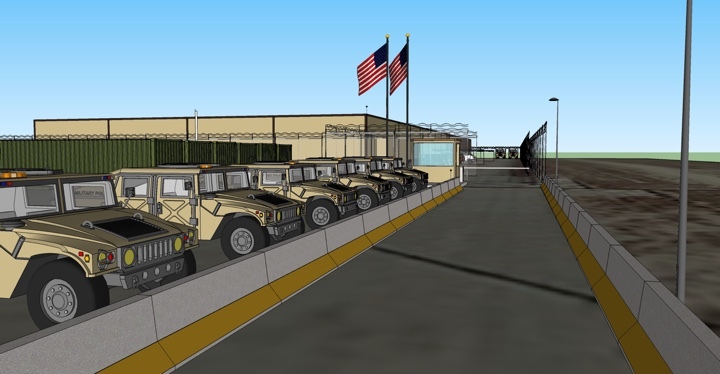 A schematics drawing for the military base on “Sicario”. Courtesy of Patrice Vermette. 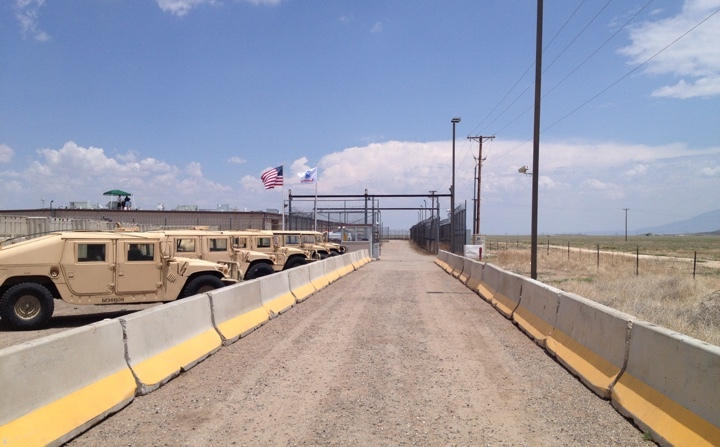 The final set of the military base on “Sicario”. Courtesy of Patrice Vermette. Kirill: I certainly appreciate that as a viewer. On this side of the screen those months and months are compressed into 90 minutes or two hours, and it’s amazing to see hundreds upon hundreds of names in the closing titles and think about how much work went into making that piece. Patrice: That’s the beauty of it.The communion between everybody and there is a lot of people involved sharing talent, knowledge and passion towards the same goal… I do the sketches, and then the set designers take them and turn them into plans and get back to me, and we talk about opening the walls and think about how it will make the camera crew’s job easier. Budgeting, set decorating, construction, painters, sculptors,… You might have the daily carpenter that comes in, and he is not part of the normal crew, but everybody should be aware. When you cut that plank of wood or when you assemble two pieces together, what’s the big picture? My approach is to keep everybody in my department informed. I think it’s important that everybody understands the common goal. What is the reason for this color to be used, for this piece to be glass, for that building to be seen through that glass? It might be important, subliminally reminding us of another scene which is going to happen in the future of this character’s life. I think that it’s very important for everybody on the crew and in the art department to understand those details. I think that if you want to get the best work out of people, they have to be personally involved. Making movies is a team effort. We build families. We live together and we spend so much time together, and I think that every name that you see at the end of a movie is important. It’s not just the director, producers and the DP. It’s everybody on the crew that is important. And here I’d like to thank Patrice Vermette for graciously agreeing to share his time with me to talk about the art and craft of production design, for taking me through building the worlds of “Sicario”, and for sharing background materials for the interview. If you’re interested in stories on how films and TV shows are made, click here for more in-depth interviews.